We have recieved plenty of feedback. Thank you for your support ! During the first week after the launch we got a lot of praise, comments, questions and suggestions. “good”, “worked fine” or “everything seems correct”. 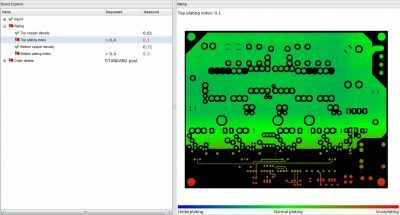 Very motivating for us to work even harder to improve and extend the PCB Visualizer functionality. 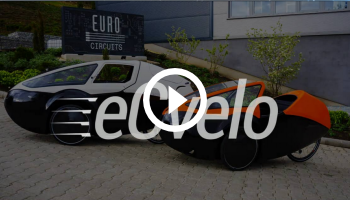 The current version is still in beta phase which means that we work on stabilizing the software, improve its performance and further develop the analysis algorithms to increase the reliability and accuracy. It is important for us to continue to recieve your feedback about how you experience the PCB Visualizer. Our priorities for further development are based on your reactions. What we learned during the first week. 1. 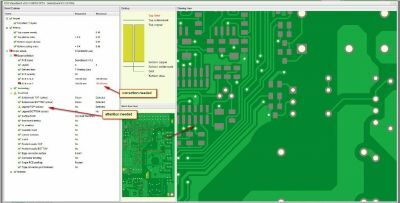 It”s not clear what to do when the PCB Visualizer shows errors – can you proceed with your order? Whatever the result shown by PCB Visualizer, you can place the order. When the import of the files was successful and a red flag is showing in the order details, we advise to check your design and your order details to avoid that you will receive an exception further in the process. PCB Visualizer shows errors but you think your data was not analysed correctly. Please let us know through the feedback form what information is incorrect. We will analyse the problem and look for a solution. You can place your order, the data will be analysed by an operator independent from the PCB Visualizer result. Import failed – PCB Visualizer works only based on Extended Gerber files as well as CadSoft EAGLE V6 files. All other file formats will result in an import failure. – However, you can place your order – older formats of CadSoft EAGLE as well as standard Gerber-files are still accepted. PCB Contour recognition – improve the success rate on contour recognition. We will publish guidelines how you can define contours so PCB Visualizer can detect the correct contour more easily . Make the results of PCB Visualizer also available after an order has been placed. You will therefore also find it in your running orders. Further extend the DRC functionalities. We show measured values now but not the location of the errors. We will build this functionality into a DRC check module that you can run after the PCB Visualizer is shown. try if PCB Visualizer works from another PC or another location. 3. What to do with the information in the plating section? When we raise the red flag in the plating section of PCB Visualizer it does not mean that we cannot produce your boards. It means that the copper distribution over the surface of your board will not be even. The values give a degree of inbalance of copper distribution over the board. but the variation of copper thickness on your tracks and in the holes will be higher when the plating indexes are lower. Designing your board with the plating indexes in mind will result in a higher reliability of your boards. 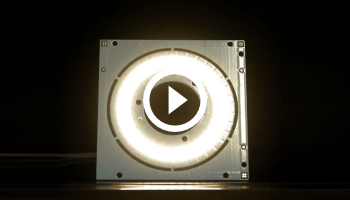 Today sees the release 1 of our PCB Visualizer project. What we want to do is to enhance customer value and customer convenience by providing faster, clearer and more comprehensive feedback with on-screen interactive possibilities. Release 1 gives you the functionality to view the data you have uploaded and to check that it conforms to the board you want to order. Is this the right data? Is all the data in the package? Has the CAD output worked correctly? To use PCB Visualizer, follow the normal “Calculate and order” procedure: fill out the boxes, calculate the price, and attach the data. Then “Add to basket”. Immediately you will see your job in the Shopping basket. The new Visualizer columns will show a spinning wheel and “Processing”. Within a few seconds (depending on the size of the data), the text will change to “Visualizer”. A red flag in the Status column means that there is an issue with the data. Click on “Visualizer” to review it and avoid an exception when the order is placed. A green icon means that the automatic checks we have run so far indicate that the data matches the order. An exclamation mark (!) indicates a non-critical difference between the data and the order. It also warns that the system could not complete an automatic analysis. If this happens place the order as usual and our engineers will run the checks interactively. 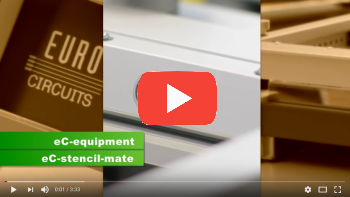 Click on “Visualizer” and you will immediately see an image of your finished PCB with your selected solder-mask colour, the build-up, a birds-eye view and an interactive viewing area. In the viewing area left click to zoom in and right click to zoom out or use the scroll wheel on your mouse. Click and drag to pan around the image. Click on the layers in the build-up to see each layer individually. On the left you can see three functions: Import, Plating and Order details. If you see a red flag then there is an issue under that heading. Click on Import and you can view each layer with pan and zoom facilities as above. You can also view combinations of layers using [CTRL] select. This is useful if you uploaded your data as an EAGLE V6.2 BRD file. You can combine the separate EAGLE V6.2 data layers (place, value and shape) to see how your component legend (or silkscreen) will look. In a later release it will be possible to build your own legend and save it for the order. Click on Plating to view the copper density distribution of your outer (plated) layers. The measured figure for the plating index tells you whether the copper distribution is within the limits demanded by good plating. A red index means that there is a potential problem of over- or under-plating. For more on this topic go here. Click on Order details to confirm that the data provided matches your order. Typical issues may be that the board size in the order is wrong, or the order calls for one component legend but there is data for two – or none, or the minimum hole size is too small for the chosen service. You can also review every part of your order. Is the board thickness correct? Have I chosen the right surface finish? Does the board need UL marking? …..
To return to the full colour board view and build-up screen, click on the text “Order details” or any of the sub-headings. If you need to correct your order, close PCB Visualizer and click on the Modify button on the left of the screen. Make the necessary changes and put the order back in the basket. PCB Visualizer will then check it again. 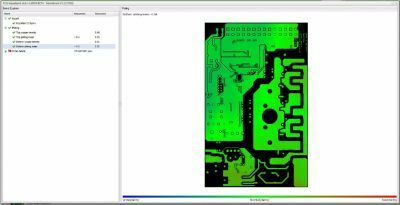 How to get the best out of PCB Visualizer Release 1? PCB Visualizer Release 1 is the first release of the Input Processor and Data Analysis stages. We will introduce modifications and refinements, based especially on your feedback (see below). It is important to understand that the data input and analysis is entirely automatic. 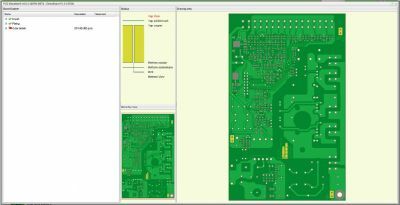 It is based on sophisticated algorithms that have been tested on thousands of data sets over the last 8 – 10 years, but a few simple rules will ensure that you get the best out of PCB Visualizer. Input only Extended Gerber (RS274X) and Excellon drill files with embedded tool sizes, or EAGLE V6.2 data. Of course, if your job uses standard Gerber with a separate aperture table or Excellon files with a separate tool list we can still accept it. Just input your order via the normal Order process, not via the basket. Use clear layer naming to ensure that you get the right build-up displayed. See our guidelines. Remember that PCB Visualizer is showing the raw Gerber and Excellon data layer by layer. The drill data is combined into the overall view, but no other mechanical features like slots and cut-outs. These will be added by our engineers later in the front-end engineering process. And the data will not be panelised unless you have uploaded panelised Gerber files. When you close PCB Visualizer you will see a feedback form. Please take a moment to share your feelings and remarks with us so that we can improve the Visualizer program. Did it work properly on your job (give us the job number so we can tweak the algorithms if necessary)? Did you find it useful? What additional functionality would you like? …..
We will continue to add functionality including more interactive options. At the Input Processor/Data Analysis stage new functionality will allow you to modify your order on the fly, correct the build-up, and build customer delivery panels on screen. The next step will be to provide feedback and interactive functionality at the Single Image stage, that is after our engineers have processed the data (see more information on how we process your data here). You will be able to see the real in-depth DRC values for the job. Where our engineer has raised an exception and proposed a solution you will be able to view the exception and accept or reject our solution without the need to go back to your CAD system or re-upload the data (unless we have been unable to provide a solution and you need new data). More information on repairs. These are our plans but we will also respond to your feedback and to your suggestions for new functionality. Our goal is that PCB visualizer will enhance customer value by providing a faster design feedback and DRC verification service, customer cost where Design For Manufacturability checks flag areas where the designer can change to a more cost-effective class, customer convenience by providing a fast visual check without the need to open his CAD or Gerber files, and customer communication by illustrating the engineer’s report and any subsequent discussions with interactive graphics.